Whats black and white and proclaims your love? 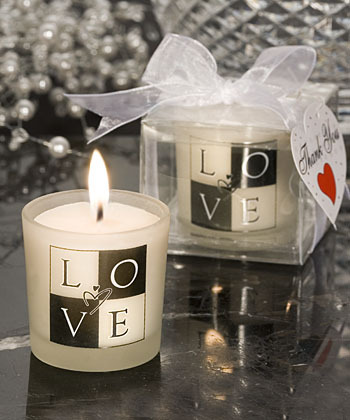 Its these LOVE design candle favors - perfect for your wedding or shower! Its love that brings everyone together to share in your special day so what could be a better token to commemorate the occasion than these stylish LOVE design candles? A unique, each 2" x 2" x2" candle has a white frosted glass holder decorated with a block lettering Love and complementary abstract heart design with a poured white candle inside. Each comes individually packaged in a clear plastic box tied with a white organza bow and an attached thank you tag. If adding personalized hang tags or labels be sure to check "YES, I'm adding tags / labels" in the gray box below or your personalized items will not be included with the order. The Custom Designer will fill in the rest of the menus. TIP: Use our Custom Tag & Label Designer. The Custom Designer will automatically fill in your selections. Personalized Tags or Labels are available for only $0.27 each. Round and Diamond tags are 1.75" tall x 1.75" wide. Tags or Labels are not attached (some assembly required). We do not correct spelling or punctuation, capital letters, etc. However you enter any personalized text is how it will be printed. Be sure to check your entries.